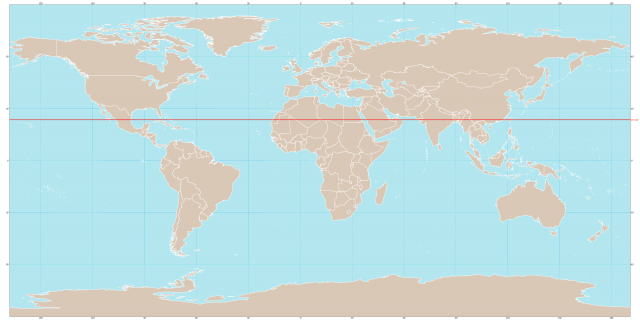 THE TROPIC of Cancer is an imaginary line encircling the Earth at the parallel latitude of 23 degrees 30 minutes North of the equator. This is the northern boundary of the Torrid Zone and the most northerly latitude at which the sun can shine directly overhead. It is at this point that the sun’s midday rays are vertical at the summer solstice on June 21–22 and is the northern border of the tropics. It is the northern counterpart to the TROPIC OF CAPRICORN. The Tropic of Cancer is one of the five major circles of latitude. A latitude circle is an imaginary ring around the Earth made up of all the points that have the same particular value for their latitude. They are based on the rotation of the Earth in relationship to the sun. The five major circles of latitude are the ARCTIC CIRCLE (66.5 degrees N), the Tropic of Cancer (23.5 degrees N), the equator (0 degrees N), the Tropic of Capricorn (23.5 degrees S), and the ANTARCTIC CIRCLE (66.5 degrees S). A circle of latitude is known as a parallel because the circles of latitude are at set distances apart and on some maps they appear parallel. This parallel marks the farthest point north at which the sun can be seen directly overhead at noon; north of the parallel the sun appears less than 90 degrees from the southern horizon at any time of the year. The sun reaches its vertical zenith over the Tropic of Cancer on June 21–22, which is the summer solstice in the Northern Hemisphere. This parallel was so named the Tropic of Cancer because the sun was in the constellation of Cancer at the time of the summer solstice. The tropics or Torrid Zone comprise the area situated between the Tropic of Cancer at the latitude of 23.5 degrees N and the Tropic of Capricorn at the latitude of 23.5 degrees S.
The tropical zone between the Tropics of Cancer and Capricorn receive the rays of the sun more directly than areas in higher latitudes. The average annual temperature of the tropics is higher and the seasonal changes are not as diverse as in other zones. The seasons in the tropics are not indicated by temperature but by trade winds off the oceans, which generate seasonal rains called monsoons over the eastern coasts. Several different climatic types are notable within the tropical zones, which are determined by distance from the ocean, prevailing wind conditions, and elevation. The tropics are home to the world’s vast regions of tropical RAINFORESTS. The AMAZON and CONGO are examples of the tropical rainforest regions in the tropical zone. The rainforest vegetation growth is credited to the monsoon rains and contains a wide variety of the Earth’s most unique plant and animal life. The northern and southern limits of the tropics are low latitude savanna, steppe, and desert regions and have decreasing seasonal rains. Tropical highland and mountain climates, which are characterized by more temperate climates, also exist where high mountain ranges lie in the zone. The high temperatures and abundant rainfall are ideal for cultivating crops of rubber, tea, coffee, cocoa, spices, bananas, pineapples, oils, nuts, and lumber; which are the leading agricultural exports of the countries in the tropical zone. The tropical rainforests are in danger from research progress in tropical medicine, advancing technology, and the demands of growing populations that have led to the cultivation and settlement of some rainforest areas. This has resulted in deforestation of the tropical forests, a condition thought to contribute to the greenhouse effect, global warming, and the elimination of many unique plant and animal species.